Anti-inflammatory painkillers are used to treat arthritis, sprains, painful periods, and other painful conditions. Most people have no trouble taking these tablets. However, some people develop side-effects which can sometimes be serious. In particular, if you have any cardiovascular (heart, stroke or blood vessel condition) or certain gut conditions, or are elderly, these medicines are prescribed with caution and only where there are no alternatives and at the lowest doses and duration necessary. People taking NSAIDs for more than 10 days should see the doctor. Remember that NSAIDs are to be used in the smallest effective dose for the shortest possible time as there is a risk of allergic reactions. Blood pressure may rise with use of NSAIDs. 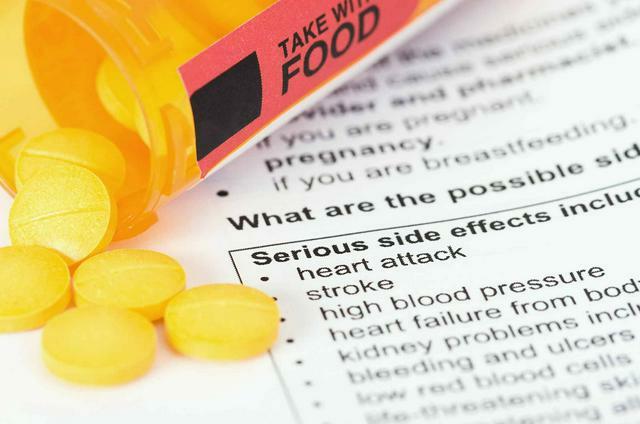 Anyone who is at risk or has cardiovascular disease (coronary artery disease) may have a further increase in the risk of heart attacks when taking a NSAID. This includes individuals who have experienced a heart attack, angina (chest pain because of narrowed arteries in the heart), procedures for widening the clogged arteries, a stroke, or narrowed arteries to the brain. As a result, people who have or are at a high risk for coronary artery disease are generally advised to avoid NSAIDs. Use of NSAIDs, even for a brief time, can harm the kidneys. This is particularly the case for people with underlying kidney disease. The blood pressure and kidney function should be monitored at least once per year but may need to be checked more often, depending on a person’s medical conditions. Short-term use of NSAIDs can lead to an upset stomach (dyspepsia). Long-term use of NSAIDs, especially at high doses, can lead to peptic ulcer disease and bleeding in the stomach. People that have experienced bleeding in the stomach, upper intestine, or esophagus have an increased risk of recurrent bleeding when taking NSAIDs. The common side effects and dangers of NSAIDs include constipation, decreased appetite, diarrhea, dizziness, drowsiness, headache, heartburn, high blood pressure, nausea, leg swelling, vomiting, etc. Most people who take anti-inflammatory have no side-effects or only minor ones. When taken appropriately, the benefit usually far outweighs the potential harms. A majority of people take a short course of an anti-inflammatory drug for all sorts of painful conditions. However, side-effects, and sometimes severe possible adverse effects, can occur.